If a government body wants to spend tens of millions of dollars for a construction project, there are lots of ways to gauge the public temperature. It's hard to imagine a more roundabout approach than the one chosen by the Rock Island County Board. Last week, the board voted to put a referendum on the April 9 ballot, and if your eyes glaze over while reading it, that might be the goal. The measure asks: "Shall the County Board of The County of Rock Island be authorized to expand the purpose of The Rock Island Public Building Commission, Rock Island County, Illinois to include all the powers and authority prescribed by the Public Building Commission Act?" Of course, most people don't know what the Rock Island Public Building Commission is, or that it even existed - let alone its current or potentially expanded authority. And there's no way to know from the words what the endgame is. 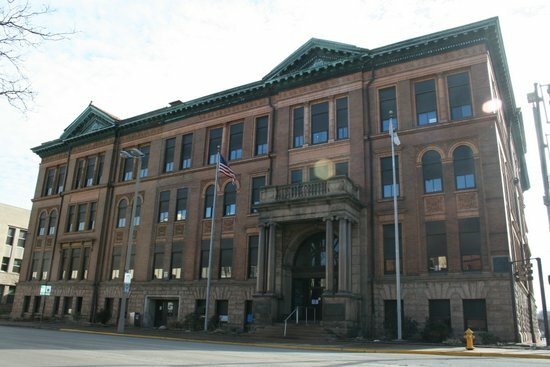 There's no mention of a new or renovated county courthouse or county office building, or of a location, or of a price tag - which could be anywhere from $13 million (the low estimate for a new court facility alone) to $50 million (the high estimate for a new courthouse and county office building in downtown Rock Island). In short, the referendum appears designed for maximum obfuscation - a seemingly innocuous question about an obscure public body. The move could easily be interpreted as a deceptive attempt to gain public support for something the public otherwise might not support. In fairness, the ultimate goal hasn't been hidden from view, and nearly everybody agrees that both the courthouse and the county office building need to be replaced or upgraded. But given the taxpayer money at stake, what's behind the strangely circuitous approach of Rock Island County government? The primary reason is that the judiciary has taken the lead and is forcing the issue because the county board has dragged its feet for two decades. Two other reasons are key: Expanding the authority of the Public Building Commission could keep property taxes level - or at least minimize the amount of a property-tax increase - while resulting in new (or, in an unlikely scenario, rehabilitated) county facilities; and, if the referendum passes, county-board members can claim that approving tens of millions of taxpayer dollars was sanctioned by voters. There are still other reasons below the surface. The vagueness of the referendum makes it passage more likely than a traditional bond referendum (in which the projects and costs would be clear to taxpayers). And the authority that would be granted by this referendum gives the county significant flexibility moving forward - both with the two buildings being discussed now and any major capital projects it wants to pursue in the future. The Illinois Public Building Commission Act was passed in 1955 to address "inadequate and outmoded public improvements, buildings, and facilities for the furnishing of essential governmental services." Public building commissions are established by local referendum and have the authority to bond but not tax; governmental bodies with taxing authority lease facilities from a public building commission to pay off bonds. A key feature of a public building commission is that, unlike a county, it does not need voter approval through a referendum to issue bonds. The Rock Island Public Building Commission was established to build only a new county jail (known as the Rock Island County Justice Center), which was completed in 2001. The commission is presently composed of Ted E. Davies, Jim Gremanis, Richard Janoski, William P. Laird, and LeRoy Peterson. Until the Rock Island County Justice Center bonds - which cost citizens $1 million a year in property taxes - are retired in December 2019, any major construction project would result in a property-tax increase equal to bond payments minus any operational efficiencies gained by new or renovated facilities. So if the county issued bonds to pay for a new courthouse and office building, the taxes to pay debt service would be on top of the taxes used to pay debt service on the current Public Building Commission bonds. Expanding the authority of the Public Building Commission gets around this political problem. Because the referendum to create it was limited to the jail, the Public Building Commission is not presently authorized to bond for or build any other facility. But if the referendum is approved, then the Public Building Commission could refinance its current bonds - similar to refinancing a mortgage after years of paying down the principal - to generate money for new construction beyond the Justice Center. As the judges of the 14th Circuit Court Facilities Committee wrote in a November report: "One million dollars of the current levy supports about $14 million of debt at today's bond rates. ... By refinancing the bonds, there would be at least $8,375,000 ... available to apply to construction costs without increasing the current tax levy." So by going through the Public Building Commission, more than $8 million of project costs for a new courthouse could be rolled into the current debt-service levy. This would reduce the amount of a property-tax increase needed to pay for any new buildings. "The ideal situation is to roll from one right into another; so we pay off the old building and we roll right into a new facility," explained Rock Island County Board Chair Phil Banaszek. The goal would be to configure a project and bond terms "so there would be no [annual] increased cost" to taxpayers. He explained that this might be possible through the combination of refinancing Public Building Commission bonds and the increased efficiency of new buildings compared to century-old facilities - which he said cost the county and its taxpayers roughly $1.5 million a year in maintenance. That would make the project property-tax-neutral, but of course it would also extend bond payments well beyond the current expiration of 2019. In theory, annual property-tax bills might not be any higher than they are now because of a new courthouse and (potentially) county office building; taxpayers would merely be making payments for a few decades more. There's one problem with this argument: Because the project scope, site, and cost haven't yet been decided, property-tax neutrality is merely a noble goal - or, less charitably, a selling point that should be treated with skepticism. The only guarantee here is that by going through the Public Building Commission, citizens would be minimizing a property-tax spike that would result from bonding through the county board while paying off existing Public Building Commission bonds for the jail. The second major appeal of expanding Public Building Commission authority is that it provides cover for the county board, which for decades has kicked this particular problem down the road. 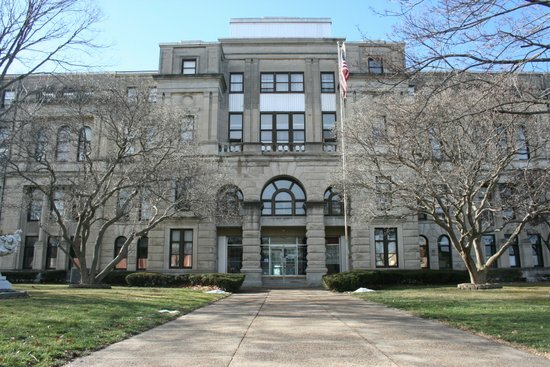 The November report by the 14th Circuit Court Facilities Committee summarized that the courthouse - at 210 15th Street - has been inadequate for decades: "A 1992 report by a Committee of the Illinois Judges Association recommended that the Rock Island County Courthouse be closed as a court facility. Years of subsequent informal talks with the County Board failed to produce a commitment or plan by the County Board to bring court facilities into compliance with applicable Minimum Courtroom Standards. Deference is usually given to the legislative and executive branches of government to act on such matters, but the County Board has failed to address the court facility need for 20 years. ... [U]nless forced to act, the County Board will continue to defer action on what it perceives as a politically controversial and unpopular decision." In a closed session during last week's county-board meeting, Chief Judge Jeffrey W. O'Connor gave the board a choice: Put the referendum on the ballot or be sued. As the Facilities Committee report notes: "[T]he Chief Judge has the authority to order the closure of the present court facilities and order the construction of a new or remodeled court facility." "They could really be snotty about this whole thing and just say, 'Look, we're done talking,'" Banaszek said. "In all fairness, I've been here 18 years, and I've heard about it from day one. ... They could actually force us, like they did with the jail." When asked why the Public Building Commission tack was being taken, Banaszek called it the "easiest way. ... It's a lot cleaner. There's some politics involved in this, too. It takes the heat and the responsibility of the decision-making off the county board as far as organizing and funding the facility." So in terms of potentially raising taxes, county-board members can reasonably say that their hands were forced by the judiciary. Passage of the referendum would further give them ostensible taxpayer sanction. And if construction of a new courthouse will happen anyway - either because of the April referendum or litigation - it makes sense to at least consider replacing the county office building (at 1504 Third Avenue) at the same time. "Could we get by here?" Banaszek said. "Yeah, we could get by. But we're looking at a building that's over a hundred years old, and my take on it is: I'm not going to ask for 25 million [dollars] over here now [at the courthouse] and then have to come back in another 10, 15 years and say, 'Guess who's back.'" The county office building, the Facilities Committee report notes, "is over 100 years old, lacks security, and ... is nearing the end of its useful life but is in better condition than the courthouse and lacks the same volume of foot traffic of the courthouse. It houses the majority of county government." While the Facilities Committee dealt primarily with the courthouse, it noted that the county office building "could also be called a courthouse annex because it houses many of the traditional general government offices historically found in a courthouse throughout this state." The Facilities Committee put the cost of new court facilities at between $13 million and $20 million, claiming that renovation is infeasible. It put the cost of new court facilities and a new county office building at between $45 million and $50 million. A June report to the county board by Estes Construction offered four options for the combination of court facilities and a county office building: the status quo ("Due to the significant life-safety, building-code, and non-compliance with the Minimum Standards for Courtrooms in Illinois, this is not recommended") for $6 million to $7 million; renovation for $40 million to $41 million; new downtown Rock Island construction for $47 million to $49 million; and conversion of a building at the old Quad City Industrial Center for $34 million to $34.5 million. The Facilities Committee report dictates that "any new court-facilities construction be physically tied to the current RICO Justice Center," but it also allows for the Quad City Industrial Center site - even though it's several miles away, near the city's border with Moline: "If it is more financially feasible (a savings of $10 million or more) to build in another location, then that location should be strongly looked at." So the referendum makes a certain amount of sense in terms of property taxes (preventing a double whammy of bond payments) and politics (making it easier for the county board to act), and the judiciary has clearly lost patience with the legislative branch of Rock Island County government. But from transparency and good-government perspectives, there are three fundamental problems with the referendum. "I am not certain that the voters will understand what expanding the building-commission authority will mean to them." Banaszek has pledged a public-education campaign about the Public Building Commission and the condition of county facilities, but the fact remains that some voters in the April election will have no more information about the referendum than what is contained in the words themselves. Second, on a general procedural level, it does not give taxpayers the opportunity to vote directly to approve or reject the project, as would normally happen if the county board wanted to issue bonds itself for a construction project. Essentially, the Public Building Commission approach reverses the normal order of things for major government projects. Instead of determining project scope and cost before going to taxpayers for approval of a bond sale to pay for it, the April ballot measure would secure the financing tool prior to a decision on what will be built, where it will be built, and how much it will cost. "I have concerns about issues such as the amount of money to be spent not being addressed," Vyncke wrote. "Nothing on type, size, location, or number of facilities to be built [is] addressed. How much will taxes be raised to pay for the new building(s)? As a voter I would certainly like answers to those questions before I would consider expanding the authority of a board ... I don't even know." Third, the referendum's open-ended phrasing (" all the powers and authority") means that it's functionally a blank check for the county board. While the courthouse and the county office building are being discussed now, the referendum if passed would give the Public Building Commission bonding authority beyond those; it would have the power to borrow money for virtually any county project allowed by law with only a majority vote of the county board and a three-quarters-majority vote of the municipality where the project will go. Simply put, the referendum is absolutely broader than it needs to be, and almost certainly broader than the spirit of the law that allows it. The Public Building Commission Act prescribes how a county board should phrase a referendum on expansion of a commission's authority: "The election authority must submit the question in substantially the following form: 'Shall the county board be authorized to expand the purpose of the (insert name of public building commission) to include (insert the purpose or purposes)?'" In other words, the law suggests that the proper approach here would be to include the projects being funded: the courthouse and potentially the county office building. Even if the Public Building Commission approach makes sense in the context of previous county-board inaction, the April referendum keeps voters unnecessarily in the dark. When asked why his board approved the broad referendum wording, Banaszek pointed to the judges who suggested the ballot measure. In an e-mail, he wrote: "The way I understand it ... , they did not want to restrict the PBC [Public Building Commission] to only certain buildings as with the current PBC (Criminal Justice Facility)." And because of the broad powers that would be granted by the referendum, the long-term cost to taxpayers could potentially be significantly more than that, and they'd have no opportunity at the polls to directly approve additional projects. Using the Public Building Commission to circumvent the normal process of asking voters to approve bonds is certainly a clever approach, and quite possibly the only practical way to address the longstanding problem of deteriorating and inadequate county facilities that the county board has for decades ignored. 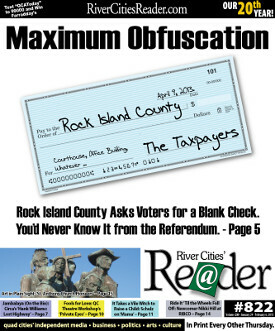 But in its lack of directness, its backwardness, and its overly broad scope, the referendum is also bad government, and it certainly won't engender any goodwill with Rock Island County voters and taxpayers.